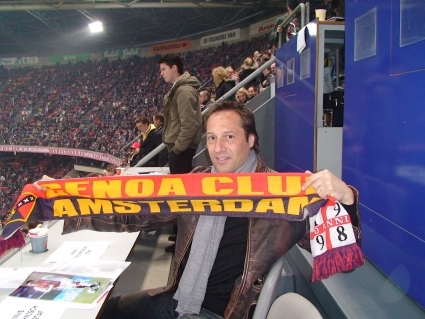 Today I had a quick chat with the assistent coach of Holland and from 1st July the assistent coach of Ajax: our member of honour mister Johnny van ‘t Schip. We talked about revelation Borriello and of course he wanted to show our special Genoa Club Amsterdam shawl in front of the camera. Thanks Johnny! DJ Pure de Mele. This by DJ Appelmoes made internetsite is on air since 23 Augustus 2007, so already 6 months now. In this first halfyear we had 14.001 visits by 7566 different visitors that watched 38.216 pages. We thank the internetsite www.grifoni.net to link 8526 visits, while 2063 times someone visited us directly and 1374 after searching on google. People from Italy visited our site 10.679 times, while Holland is on the second place with 1442. Third and fourth are Sweden (369) and United Kingdom (241) just before Norway and the United States with 237 and 190 visits. The city with the most visits is, of course, Genova with 3818, while Milano is on the second place with 3262. Amsterdam and Rome are on the third and fourth place. Thanks all and keep reading this internetsite !! A sms from our President Hans Otten and his ‘adjudant’ Bart in Genova: “Because of the 2-0 and the fifth place in the Serie A; it’s a big party down here.” Well Hans, we’re also partying in Amsterdam at the moment! UEFA-cup here we come 🙂 As soon as possible i’m posting the best You Tube clip of the match against Calgiari. Forza Genoa! DJ Pure de Mele. The website genoaclubamsterdam.com is now in the air for one week. We received some lovely compliments from fans all over the world. Some webstats: 2.000 unique visitors from 39 countries like Saudi Arabia (20! ), Tanzania, Japan, Moldavia and Dominican Republic. Genoa ovunque! The most visits we received from Italy, especially Milano.. The Arena video was the most watched content. Keep on visiting our website and don’t be afraid to use the comments. ps: Do you know somebody with an own Genoa internetsite? Please let them place a link to us! Grazie!